Outremer 45 Catamaran [Sail Magazine Boat Review] - Just Catamarans Inc.
Just Catamarans is the exclusive North American distributor for Outremer Catamarans. It’s funny the way things that work right almost inevitably tend to look right as well. Case in point: the Outremer 45, a catamaran that can’t help but turn heads with its large rig, nicely sculpted cabintrunk and narrow, purposeful bows. Better yet, under sail the boat more than fulfills any expectations you might have had checking it out at the dock, being a performance bluewater cruiser that is an absolute blast to sail. A product of the celebrated Outremer yard in La Grande Motte in the South of France, the Outremer 45’s commitment to performance and safety begins with a design that is not just well executed, but downright smart, having been born of almost a quarter century of boatbuilding. The hulls and deck, for example, are built in vinylester with a divinycell core. However, the hull layup beneath the waterline is solid glass in the interest of security should you ever experience a grounding. Similarly, in spite of the boat’s emphasis on performance, Outremer is not afraid to use a little more material, including carbon, in high-load areas to ensure rigidity and durability over time. Along these same lines, the hull/deck joint is not just glued on an inward-turning flange, but securely glassed in all around, and the bows include multiple “crash boxes” to prevent water ingress in the event of a collision. The daggerboard trunks are also not only rock-solid, but the boards themselves designed to break away first, acting as “fuses,” as it were. “The intent is to build a boat that will last 50 years,” said Outremer director of sales Matthieu Rougevin-Baville, who was with me for my sail trial, adding that in the course of a half a century, “something will happen” that will require this extra measure of build quality. He also noted how on one occasion an Outremer 45 grounded for four days on a reef off Tahiti and came away with little more than some scratches below the waterline. Overhead, our test boat carried a carbon Axxon mast and aluminum boom flying a powerful, fully-battened square-top main. (A carbon boom is also available as an option.) The inner headsail is self-tacking, and a reaching sail can be flown off a sprit. Again, the hulls are narrow, with a plumb stem and transom to maximize sailing length. The low-profile cabintrunk is also gracefully sculpted to help reduce windage. Interestingly, Matthieu noted that the boat’s streamlined design is not just about speed, but also safety and seakindliness. “Narrow hulls produce far less pitching,” he said. “That is what comfort at sea is really about, not the size of the beds or massive bedrooms.” He added that by being more easily driven, you can also reef the boat beforehand in unstable conditions and still keep moving, a nice option when shorthanded. Again, the Outremer 45 isn’t just well made, but smart in its overall conception. One of the great things about not maximizing your cabintrunk in the interest of having an absolutely enormous saloon is that it opens up all kinds of space topsides for things like nice wide-open sidedecks and easy transitions to and from the cockpit. The Outremer 45 also includes plenty of nice touches to ensure you are able to move about in safety: like handrails along either side of the cabintrunk; toerails outboard; and a great little anti-skid equipped step just aft of the track for the self-tacking headsail for climbing up onto the cabintrunk to tend the main. Alas, I’ve sailed aboard a number of multihulls where going forward in any kind of a seaway is a true leap of faith. However, the Outremer 45 is not one of them. Aft, a single helm station with a wheel to port comes standard, but there is the option of adding a pair of outboard tillers complete with a composite bucket seat, a la, say, a MOD70 trimaran. They’re incredibly cool, and according to Matthieu, pretty much everyone gets them. The main traveler spans the width of the cockpit along the aft edge of the seatback of an L-shaped bench enclosing two sides of a fair-sized dining table. On our test boat, the dinghy davits also served as mounts for a pair of solar panels. Control lines for the daggerboards run aft to either side of the cockpit. Lewmar winches, tracks and blocks were used throughout in concert with Spinlock clutches, a Facnor furler for the jib and a Profurl continuous-line furler at the end of the sprit for the boat’s A-sail. The short length of the cabintrunk means the Lewmar windlass can be installed (and the chain stored) a bit farther aft than you usually see, helping keep weight toward the middle of the boat with an eye toward further reducing pitching. Another funny thing about boats that work well is that I inevitably find myself running out of room when writing about them. Not only that, it’s the accommodations that seem to get short shrift. I guess that shows where my priorities are. Suffice it to say that while the Outremer 45 may not have the massive amounts of accommodation space found on those cats more typically found in the charter trade, it remains a comfortable boat, with tastefully appointed accommodations. Two different arrangements are available, including a three-cabin layout in which the entire starboard hull is given over to the owner, and a four-cabin layout in which an additional cabin is located in the starboard bow. 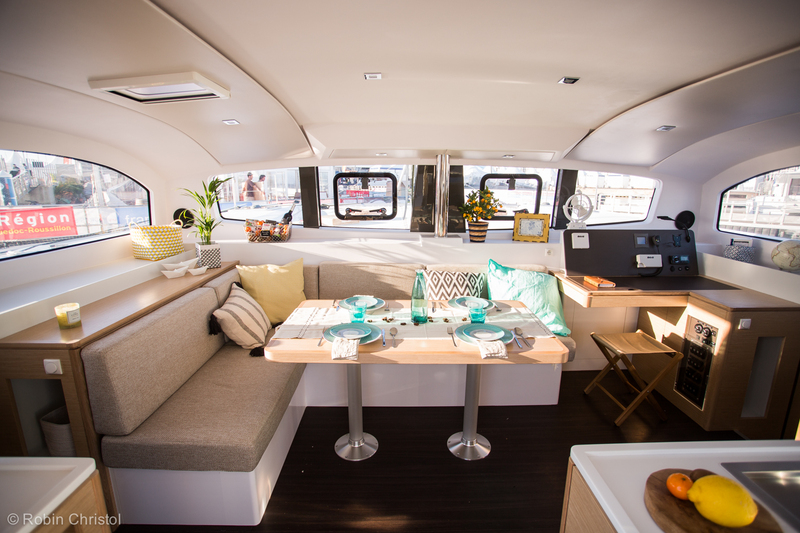 The saloon features an L-shaped galley to starboard with the inboard counter nicely positioned so that it can be easily accessed from the cockpit when the boat’s large sliding door is opened—a excellent way of transferring snacks and drinks. Directly forward of the galley is the nav station, across from which is a dinette. It never ceases to amaze me how inefficiently the massive saloon spaces are configured aboard some larger cats. 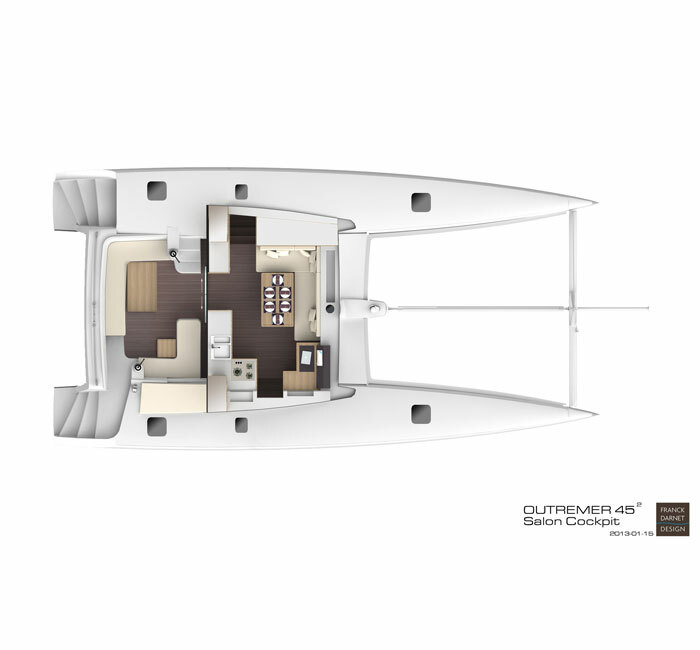 Aboard the Outremer 45, though, the layout is efficiently and effectively conceived, providing plenty of room for all. Underway is where the rubber meets the road with a boat like the Outremer 45, and for our test sail, we were lucky to have outstanding weather—winds in the high teens out of the northeast on a short delivery from Miami to Fort Lauderdale. Motoring out of Government Cut, we bore away onto a close reach in around 15 knots of breeze and were soon storming along at a very satisfying 9-10 knots. Equally impressive was the boat’s motion in the 4-5ft seas, which was easy and predictable, in stark contrast to all too many cruising cats out there. Marketing hype aside, a half-knot of boatspeed more or less isn’t going to make much of a difference, even on passage. However, a nasty, whippy motion in a seaway is. The Outremer 45 is a boat that takes good care of its crew. The Jefa steering system also felt not only light but wonderfully responsive to the wind and waves—one of the true marks of a performance multihull. Flipping on the autopilot confirmed that the rig and hulls were in good balance, as it had little to do, even in the moderate seaway. Closing in on Fort Lauderdale we threw in a few tacks, just to see how the boat would do, and it did just fine, despite the conditions being such that many less nimble cats would have faltered. Bearing away toward the channel into Port Everglades, and with the wind falling light, we hoisted the A-sail, which kept our speed up in the 10-11 knot range on a broad reach right through the end of our short passage. My only complaint? That said passage couldn’t have been three or four days longer. No surprises here, especially given the Outremer’s easily driven hulls. At 1,000 rpm the boat scooted along at 3.5 knots, while revving up to 2,700 rpm increased our boatspeed to 7.5 knots. There are basically two kinds of sail trials: those where you do your job and evaluate the boat’s merits; and those during which you find yourself wishing (dreaming?) that the boat in question was yours. My sail aboard the Outremer 45 definitely fell under the latter category: the kind of boat that is not only expressly intended to sail over the horizon in search of adventure, but also a heck of a lot of fun to just sail. A world-class design team includes Barreau-Neuman for the naval architecture, Frank Darnet Design for the interior design, and the deft hand of Patrick le Quement for the overall design cohesiveness. Contact Just Catamarans to inquire on build-out dates and build your Outremer 45 Catamaran.